From classic depictions of rivers, oceans, brooks, lakes and ponds to today's more edgy environmental concerns, artists have always examined the role of water, a key element of life, in their work. 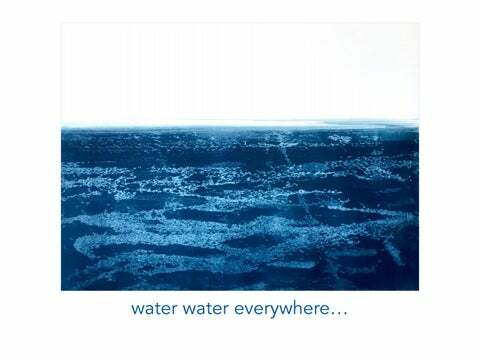 water, water everywhere… looks at water in art from the 19th, 20th and 21st centuries. Just as it takes water to sustain life, it also takes water to make art. Frances Ashforth is a Connecticut based artist whose work reflects the geography and geology of intersecting habitats surrounding land, water, mountains and deserts. Her passion for fly-fishing, and her time spent in remote places, inspires her work in all media. Francesâ&#x20AC;&#x2122; work is exhibited nationally and internationally. Her work is in private collections throughout the world. Susan Williams is a working artist living in Maine and California. Susanâ&#x20AC;&#x2122;s current work is inspired by the landscapes she inhabits - a gentle balance as seen through her eyes, and recorded by all senses. The media of oil on mylar lends itself to mystical nature of the waterscape and its surroundings. Her paintings are shown in galleries in New York, Maine, Connecticut and throughout the country. J Henry Fair is an international environmental photographer whose work depicts industrial scars throughout the world. Water is used often in industrial production, but it also used as a repository for all types of toxic waste. His images, while abstracted and beautiful, illustrate manâ&#x20AC;&#x2122;s heavy hand on our of most precious resources. Henry shows both nationally and internationally, has published several books on his works and has been written about extensively. Will Vogt is a lifelong narrative photographer who captures people in their familiar personal habitat. A camera constantly with him, Willâ&#x20AC;&#x2122;s subjects are relaxed and at ease as if there is no one recording them. Favorite subjects come from summer life in Watch Hill, Rhode Island; the ranches of Texas; the moors of Scotland; night life in New York and beyond. He is currently working on a book which captures these intimate scenes. Willâ&#x20AC;&#x2122;s work has been shown throughout the country. Julie Betts Testwuide is a Bedford, New York based photographer who travels extensively to capture nature and its creatures at their most basic level. Whether it is wild horses on a remote island, a figural narrative or a boat wistfully moving across the water, her work is sensitive and sensual. Julie shows throughout the country and her works are in numerous private collections. Lisa Ghriskey is a Bedford, New York based artist who finds inspiration from nature. In all media, Lisaâ&#x20AC;&#x2122;s work, illustrates the simple beauty of nature and natural things. Whether it is the simple detail of water-lilies in a brook reflecting passing clouds or intricate collages of inspired images, her work is varied and inspired. Lisaâ&#x20AC;&#x2122;s work can be seen in galleries in Maine and Connecticut and has been collected throughout the country. Thomas McNickle is a Pennsylvania born artist who works both en plein-air and his studio. His work depicts his life and its intimate surroundings. His watercolors are generally captured on site and they have fresh of the moment quality. Whether it is cows grazing in evening light or the magic of lights reflecting across a body of water, his work is always fresh and alive. Thomas exhibits and teaches throughout the country. Mary Prince is a landscape and still life painter and print maker who lives in New York City and who paints in Downeast Maine, the Catskill Mountains and New York City. Exploring the dynamics of light, color, and texture of her surrounding world, her paintings and prints vigorously capture the atmospheric changes that animate nature. Maryâ&#x20AC;&#x2122;s artwork is in museums and in collections throughout the US. Paul Jenkins is an American Abstract Expressionist painter who was born in Minneapolis and lives in Brooklyn. Success came to him in the late 1970’s and early 1980’s when painting came back into fashion. He works are fluid densely worked surfaces and are created by the simple act of making art. Jensen’s work can be seen in many major museums including the Metropolitan Museum of art, the Phillips Collection and the LA Country Museum. Sol Lewitt is a Hartford, Connecticut native who came to fame in the late 1960â&#x20AC;&#x2122;s with the invention of wall drawings and building structures. Lewitt is considered the founder of minimal and conceptual art, working alongside such luminaries as Robert Ryman, Dan Flavin, Frank Stella, Jasper Johns and others. He has been in hundreds of exhibitions throughout the world and is represented in most major museums. Edward Holland is conceptually grounded in literary and art-historical sources. Using William Gaddis’ labyrinthine novel “The Recognitions” as a point of departure, his current series employs linear depictions of constellations in the modern Zodiac as the geometrical foundation of each piece. Holland received a BFA in Painting from Syracuse and a MA in Studio Art from NYU. His work has been shown in galleries nationwide and discussed in ArtZealous, The Huffington Post and in Eyes Towards the Dove, among others. He lives in New York City. Margot Carr is an oil painter whose works are inspired by the cobalt blue skies and cadmium green lawns of the Eastern End of Long Island. Margot says..."I paint to capture a moment of sunlight upon oceans, lawns, marshes and architecture - leaving areas unfettered to allow - my viewers to complete the details in their minds and react based upon their own visual experiences." Steve Cope graduated from the Massachusetts College of Art, and received his MFA from Boston University. Â A long time fixture of New York and Philadelphia art scene, Steve has taught at the New York Studio School among other places. HisÂ exhibition history is extensive having been both privately and publicly shown. While he painted large scale works for years, recently he changed his format to miniature panoramic landscapes with the impact of monumental work of art. The works are painstaking rendered to the utmost detail. Charles Ebert was an active member of the Cob Cob Art Colony in Greenwich and student of John Henry Twachtman. He exhibited at the National Academy of Design, the Carnegie Institute, the Corcoran Museum of Art, the Corcoran Art Gallery, and The Pennsylvania Academy of Art among others. Works can be seen in numerous museums including the Florence Griswold Museum in Old Lyme, Connecticut. John Henry Twachtman was born in Cincinnati, Ohio and studied in Munich, Venice, Florence and Holland and Paris. After his studies abroad, he returned to the United States landing in Greenwich, Connecticut, where he became the leading member of the Cos Cob Art Colony. His farm on Round Hill Road in Greenwich was a lifelong subject of inspiration. Twachtmanâ&#x20AC;&#x2122;s works are in numerous museums and private collections throughout the country. Herman Dudley Murphy was born in Marlborough, Massachusetts in 1867. Murphy was a member of the Boston School with Edmund Tarbell and Frank Benson, among others. Landscape, figures and still lifes were all favorite subjects. He also established a frame studio with Charles Prendergast and W. Alfred Thulin called Carrig Rohane. His work and frames are numerous private and public collections. Oscar Anderson was born in Sweden and emigrated to the United States, landing in Hartford. It was there he studied with Charles Noel Flagg. Eventually he moved to Gloucester and became the leader of the Cape Ann Art Colony. Along with many of artists of the time, Anderson completed many WPA murals. Carl Lawless was born in 1894 in Chicago and studied at the Chicago Academy of Fine Arts and the Pennsylvania Academy of Fine Arts. Ultimately he moved to Mystic, Connecticut where he was one of the founders of the Mystic Art Association. Charles Henry Gifford was born in the Massachusetts near New Bedford in 1839. After serving in the Civil War (where he was captured and served time in Libby Prison in Virginia) he opened a studio in New Bedford, where he painted and taught art for the remainder of this life. Gifford is well known for his depictions of the coast of New England, including Marthaâ&#x20AC;&#x2122;s Vineyard, Nantucket, Cuttyhunk, and the White Mountains, and also upstate New York. Horace Wolcott Robbins was born in Alabama to Connecticut parents in 1842. He studied at the National Academy and then served in the 22nd New York Regiment during the Civil War. He was elected to the Century Association in 1963 and became an associate at the National Academy of Design in 1864. He joined his friend Frederic Church on a visit to Jamaica in 1865. After 1865 he began spending summers in the Farmington Valley in Connecticut. He exhibited at Pennsylvania Academy of Fine Arts, Boston Art Association, Brooklyn Art Association, American Watercolor Society, Artâ&#x20AC;&#x2122;s Fund Society and the New York Etching Club. His works can be found in many major museums. Richard William Hubbard was born in Connecticut in 1816 and graduated from Yale in 1837. He studied painting Samuel Morse and Daniel Huntington in New York and travelled to Europe in 1840-41. He exhibited at the American Art Union, The Artistâ&#x20AC;&#x2122;s Fund Society, the Century Association, the Boston Athenaeum, Brooklyn Art Association, National Academy of Design, and various other places throughout the United States. His studio was in the famous 10th Street Studio building in New York. Sanford Gifford, Frederic Church, Albert Bierstadt and others had studios in the famous building. He has works in the Metropolitan Museum of Art and numerous other museums and private collections. Sandor Bernath Sandor Bernath was born in Hungary in 1892. After emigrating to New York he exhibited at New York Watercolor Club and American Watercolor Society, the International Watercolor Exhibition, and the Whitney Studio Club. The Brooklyn Museum eventually purchased his painting, Surf, and displayed it in their 1924 show, Loan Exhibition of Brooklyn Art Treasures and Original Drawings by American Artists. James McBey was a a generally self-taught Scottish born artist. Originally a banker, he abandoned his career to practice art full time. Because of poor eyesight he was unable to serve in battle in WWI but became the official war artist to the Egyptian Expeditionary Force, painting notable portraits of Emir Faisal and T. E. Lawrence. He traveled to the US in 1929 to marry and lived between Morocco and US for the remainder of his life. His work is held by the National Portrait Gallery, London, the Fine Arts Museum of San Francisco and the National Gallery of Art. John Rogers was born in 1906 and was president of the Art League in Nassau County- best known for maritime and industrial painting. He worked on commission for New York Life Insurance and had illustrations in the The New York Post, New York Times and HeraldTribune. He was a member of the American Watercolor Society, Brooklyn Watercolor Society and Salmagundi Club. Malcolm Moran is an artist living in Greenwich, Connecticut. His paintings, drawings, and sculpture have been exhibited throughout the United States. Born in New Orleans, Louisiana, in 1948 where he lived there until his mid-twenties. He is a graduate of the University of the South and the Rhode Island School of Design. He is a painter, printmaker, and sculptor. Geoffrey Gorman is an international artist living in Santa Fe, NM. Geoffrey grew up in Baltimore, Maryland in, as he refers to it, a “Huck Finn-like” environment, old quarries, woods filled with animals, dilapidated barns and fallen houses, complete with human and animal characters. All these were and continue to be the sources for Gorman’s sculptures. Rafael Soares is a Brazilian born artist living in Rhode Island. Rafael predominantly paints animals in watercolor. He depicts each species perfectly, but he differs from other animal painters by his ability to capture the personality of each subject. This achieved mostly in his lively interpretation of their eyes. The viewer almost knows what they are thinking or about to do next. He exhibits extensively throughout the United States. Ralf Fell Â Â was born in Chicago in 1970, Ralf was immersed in the world of hand work, his father being a master carpenter and his mother, a seamstress and tailor. Observing his parents' crafts, Ralf became attuned to detail, delicacy, and design. Ralf studied at the American Academy in Chicago with Bill Parks. He then traveled east to study in Connecticut at the Lyme Academy. Ralf has over twenty solo exhibitions to his credit, and his work is found in hundreds of private and corporate collections across the globe, including Deutsche Bank, Frankfurt; Boeing, Chicago; Swedish Trade Council, Stockholm; and Pfizer Inc., New York. George Constant was born in Greece and emigrated to the United States in 1910. He worked in the WPA and other Federal Art Projects in the late 1920â&#x20AC;&#x2122;s. He showed at numerous institutions including the Whitney Museum of American Art, the Pennsylvania Academy of Fine Arts, the Victoria and Albert Museum. An exhibition of works inspired by water.